THE SHY LIFE PODCAST - 213: CATCHING UP WITH CUTHBERT THE ROBOT! Here we are for episode 213! Paul takes time out to catch up with Cuthbert - to find out about his favourite TV, music, food, books etc. There are also poems - but it is Cuthbert who is going to be reading them; he does a pretty good job too!! Our next episode, number 214 is the first of our LIVE Pride48 shows for December 2018!! Do join us, won't you?! Please email me at shyyeti@yahoo.co.uk if you have any comments - you can even send me a sound-file and I'll include it on the show. The music is by Shy Yeti and Luca. Sound effects by Paul Chandler. All content of this episode is Copyright Paul Chandler, 2018. Episode 213 was recorded between 14th and 15th November 2018, with clips from 1994 episodes of SUTTON PARK. Here we are for episode 214! Paul receives exciting news during the December 2018 Live show - Sunday 16th December 2018. When broadcast there were some technical problems - but this version of the show is complete and also contains extra material. Thanks to everyone in the chat-room and also to Harry for telling us more about his song-writing! Our next episode, number 215 will be our official Christmas Special - although we always do quite a few special Christmas episodes around this time of year; and 2018 is going to be no different! Do join us, won't you?! Please email me at shyyeti@yahoo.co.uk if you have any comments - you can even send me a sound-file and I'll include it on the show. The music is by Shy Yeti and Luca. Sound effects by Paul Chandler. All content of this episode - except clips from other podcasts - are Copyright Paul Chandler, 2018. Episode 214 was recorded live on 16th December 2018, with inserts recorded on 10th December and extra material recorded on 11th November 2018. This episode also contains clips from recent episodes of That's A Shame podcast and a clip from a 1994 episode of SUTTON PARK. Here we are for episode 215! Paul is distracted by events from the December live show and is too busy to notice that Ikk is upset! We catch up with some Christmassy guests, make a return to local radio and hear what Paul got up to on Christmas Day 1996! All this and much much MORE!!! Our next episode, number 216 is our LIVE breakfast show broadcast on Christmas Day 2018; our 2nd LIVE episode of December!! Do join us, won't you?! Thank you to everyone involved in the making of this special edition of the show! Please email me at shyyeti@yahoo.co.uk if you have any comments - you can even send me a sound-file and I'll include it on the show. The music is by Shy Yeti, Luca and The Seaford Singers. Sound effects by Paul Chandler and Soundbible. All content of this episode is Copyright Paul Chandler, 2018. Episode 215 was recorded between the 26th November and 15th December 2018 - with Sutton Park clips from Christmas Day 1996. Moving on! We do have a script coming up - so I don't want to say too much else this time... However writing this post it has inspired me to share with you a little list; with links - of all our Christmas-related posts over the years. There are a few gems out there, although many have been reproduced in my books over the years! Still... You can read them free here; so why not take a look!?! A quick look at Mr Yeti's Christmas blog-posts over the years!! Christmas was mentioned a few times during posts between 2004 and 2008 - but there wasn't any specific posts for the season; however this is the 10th year that we've done a regular Christmas post! This year we released two poems for the season! There were two poems released around Christmas 2011! Christmas in 2013 was decidedly gory! Hooray!! There were all manner of Christmas posts back in 2015 - the first was a script from my HOT STUFF!! series and the second was a prose piece and some seasonal photos. ...and, of course, our 2018 Christmas script is coming up at the end of this post!! Next time I post here it'll probably be 2019 - or very close to it... How time flaps!! HAPPY CHRISTMAS AND A HAPPY NEW YEAR!! Thank you, again - so much for your support during 2018! PS You're unlikely to have noticed because you don't get to see the same facts and figures as I do - but we are rapidly approaching our 500th post on SHY YETI'S SHY PLACE... It won't be until late January or early February, but I am hoping to come up with some way in which we can somehow celebrate this milestone! Mr Yeti broadcasts live from space on Christmas Day! Paul's audio diary recorded between Christmas Eve and New Year's Day! Behind the scenes of the day that Mr Yeti volunteered to take over the BFO just for one episode! This time Mr Yeti talks with George In Atlanta. A compilation of lots of clips from The Shy Life Podcast - old and new which are still residing on Paul's phone! All this and we catch up with our American correspondent in France - who is no longer in France!! This time Mr Yeti talks with Leigh Robertson from Chewing The Cud about the big music and movies of 1999. 229. The Dragon And The Cacti! 230. The Truth About The Murder Mystery Weekend! The first of three 10 year poetry anniversaries for Mr Yeti during 2019. There will - most probably - be live shows every month; maybe even more than one closer to Christmas; but we also have plenty of other episodes either in planning or partially recorded. Love is in the air on The Shy Life Podcast - but will everything go to plan!? The second and third of three 10 year poetry anniversaries for Mr Yeti during 2019. Gladstone McWhiskers has a guest - but his assistant, Oliver Louse and Oliver's cat friend - Deeley (former-aide to both Shy Yeti and Charlie Grrr) are yet to learn who The Mouse Of Commons is hosting; he's being terribly secretive about it and we join Deeley and Oliver as they are doing their best to learn more by peeping through a window above the door to Gladstone's Private Chambers. What can you see? What can you see? Sorry! Sorry! But my question remains - WHAT can you see? Someone dressed as Santa, do you mean? Are you sure it's not Charlie Grrr in the middle of some sort of promotional campaign? A Christmas album, say? Why don't you go in there and pull his beard; just to see one way or another? I'm not sure I like the sound of that... Hey! I've had another thought... If it's not Charlie Grrr then maybe it's that Ukk The Alien; he's a shape-changer, isn't he? Oh! What's up? Did you swallow a cob-web? No! Ikk... Ikk is his name, NOT Ukk! Don't you LIVE with him? Which is most weeks, isn't it? Doesn't it break down all the time? It's what I do best... After all I want to impress Santa! You're just hoping for some high quality cat-nip; I know you! Of course I can sing - I'm a cat - cats are ace at singing? Why do you ask? I guess so - you think he'll want me to do a solo? He might do, why not! Pleased to hear it... Anyway, Gladstone - are you going to tell them or should I? What is it, boss? You need something doing? Blimey... Don't you even get to have a summer holiday? I have tried - but people usually recognise me... And if I try for a beach holiday then it's just too hot sitting in the sun with this beard? No! No! I definitely believe in you... I can see you now - right in front of me! Yes... Yes... That sounds fair! HALF THE WORLD!?! JUST OLLIE AND I? Then we're all good... Any questions, Deeley? Don't worry - at least you're not wearing a large furry red coat and a false beard for the whole of December! THE FOUR OF THEM POTTER OUT OF THE ROOM IN SEARCH OF MULLED WINE - MAKING SOME VERY ODD NOISES THAT SOUND RATHER LIKE THEY ARE ATTEMPTING TO PURR!! ...AND A HAPPY NEW YEAR - 2019!!! This script was written between Monday 27th November and 23rd December 2018, with some rewrites up until time of posting. This post and all contents are Copyright Paul Chandler, 2018 - except for the excellent cartoons which were drawn and are owned by MAW Holmes for Round The Archives productions. Here are the most recent ones! SHY YETI'S BIG DINNER DATE! Here we are for episode 210! Paul catches up with his friend OtherPaul for an early birthday meal at a favourite restaurant, Yeti Uncle John is paranoid that Paul is wining and dining some top podcasting executive and may be planning to get rid of the all... The truth is far more innocent - but the damage is already done! Thanks to P.H. for travelling so far to meet up for a nice early birthday meal with me. Our next episode, number 211 sees us chatting with Freakquincy - the host of the excellent podcast, The Gay Wasteland, available on all of your favourite podcasting hosts. Do join us, won't you?! Please email me at shyyeti@yahoo.co.uk if you have any comments - you can even send me a sound-file and I'll include it on the show. The music is by Shy Yeti and Luca. Sound effects by Paul Chandler. All content of this episode is Copyright Paul Chandler, 2018. Episode 210 was recorded between the 3rd and the 5th November 2018. Here we are for episode 211! This time Mr Yeti talks with Freakquincy from The Gay Wasteland podcast. We talk about our shared love of music - and also about singing! Not only that but we discuss films, books, travel and food! Our next episode, number 212 sees Paul and Nick reunited for a show about the big hits of 1979! Do join us, won't you?! Please email me at shyyeti@yahoo.co.uk if you have any comments - you can even send me a sound-file and I'll include it on the show. The music is by Shy Yeti and Luca. Sound effects by Paul Chandler. All content of this episode is Copyright Paul Chandler, 2018. Episode 211 was recorded on the 11th November 2018. Our next episode is another music edition - where Nick and I discuss the big hits of 1979! PODCASTING KILLED THE RADIO STAR! Here we are for episode 212! Nick and Paul discuss the big hits of 1979 on both sides of the pond; some of the regulars (those actually alive back then!) talk about their memories of this year whilst Ikk has a go at singing some of the tunes! Thanks to Nick Goodman for all his help with this episode! Our next show, number 213 sees Paul turning to Cuthbert The Robot for some computer chat! Do join us, won't you?! Please email me at shyyeti@yahoo.co.uk if you have any comments - you can even send me a sound-file and I'll include it. The music is by Shy Yeti and Luca. Sound effects by Paul Chandler. All content of this episode is Copyright Paul Chandler, 2018. Episode 212 was recorded between the 15th and 18th September 2018. Next time it'll be our actual Christmas post - with a special Mouse of Commons-related Christmas script... We'll also have more episodes of the podcast - some of them might even be Christmassy, but there are plenty of others to balance that out; it just depends how much time I get to edit between now and the end of the month! P.S. Thank you to Toby for these recent photos of Mr Deeley Noisy-McBeast. P.P.S. The cartoon at the very bottom of this post is a promotional illustration for the podcast, Round The Archives, which I occasionally appear on (and produced the end title theme of!) I'm the one with SY (for Shy Yeti!) on my cap. The cartoon is drawn by M.A.W. Holmes - another contributor of the show. 213. Catching Up With Cuthbert Computer! Please note: The schedule will probably alter at this point to allow for the Christmas period - but these are pretty much the next batch of episodes once we're into early 2019. All episodes numbers are subject to change. Paul receives exciting news during the December 2018 Live show - Sunday 16th December 2018. Paul is distracted by events from the December live show! 228. The Dragon And The Cacti! 229. The Truth About The Murder Mystery Weekend! 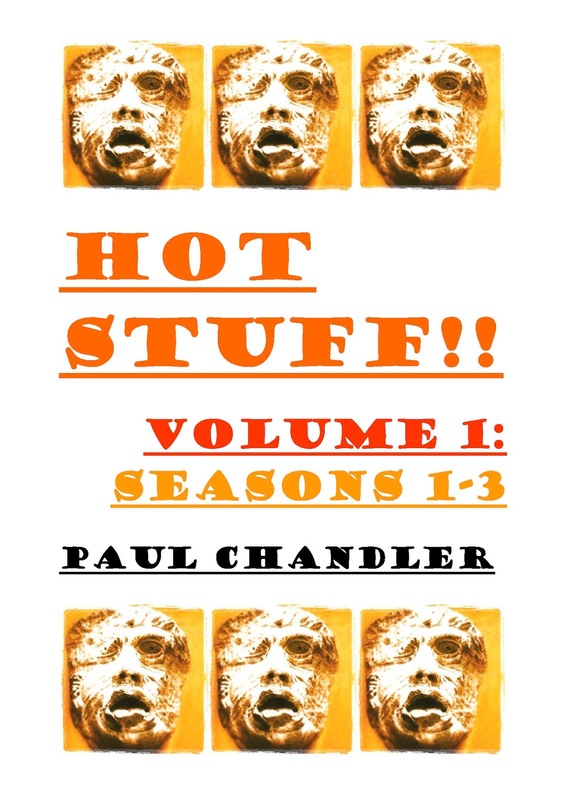 This week there will be more chatter about recent podcast episodes that I recorded back at the start of November, whilst staying down in Kent - and I also have news about a compiled edition of the first three seasons of HOT STUFF!! All that and plenty of cute photos of Deeley the Cat!! THE SHY LIFE PODCAST - 208: WELL, IT'S MY BIRTHDAY TOO, YEAH! Here we are for episode 208! Having returned from Kent, with encouragement from Harry - Paul decides to throw a belated birthday party in London and invites a number of his friends, short-notice. Toppie is also there via the wonders of modern technology and all is going well until an encounter with the lady who owns the venue where the party is being held; she is (most certainly!) a little different! Thank you to all my special guests this time; you know who you are - I don't want to spoil the surprise for the listeners! Our next episode, number 209 is a behind-the-scenes diary about some of the recording that I got up to during my birthday week away; with previews of some episodes that are yet to be released! Do join us, won't you?! Please email me at shyyeti@yahoo.co.uk if you have any comments - you can even send me a sound-file and I'll include it on the show. The music is by Shy Yeti, Harry F. and Luca. Sound effects by Paul Chandler. All content of this episode is Copyright Paul Chandler, 2018. Episode 208 was recorded between the 1st October and 14th November 2018. Our next episode is a behind-the-scenes show from my week off between the 9th and 16th November - with a few previews of some of my forthcoming guests from future weeks. THE SHY LIFE PODCAST - 209: SHY YETI'S BUSY WEEK AWAY! Here we are for episode 209! This episode we present a behind-the-scenes diary about what went on during Paul's week away in November 2018. There are lots of specially recorded chats - out-takes and a preview of four different guests who will feature in a quartet of episodes that have yet to be released; but will be soon!! Thanks to everyone who took part - especially Harry Fulton who came with me down to Kent to help me share my birthday and to Toppie Smellie for staying up well after midnight just so we could record some very silly things for the show! Our next episode, number 210 is all about Mr Yeti meeting up with an old friend for dinner - but the regulars experience an acute case of F.O.M.O. Do join us, won't you?! Please email me at shyyeti@yahoo.co.uk if you have any comments - you can even send me a sound-file and I'll include it on the show. The music is by Shy Yeti, Luca and Harry F. Sound effects by Paul Chandler. All content of this episode is Copyright Paul Chandler, 2018 - except for the music and lyrics to the song "Dan" by Harry F which appears during this edition of the show. Episode 209 was recorded between the 9th and 16th November 2018. I've also been a guest on another show - George In Atlanta - and it also seems a good time to announce that George also recorded for THE SHY LIFE PODCAST during the same recording session on Monday 12th November 2018... The full SLP interview is yet to be released, but there are clips and behind-the-scenes clips from the interview on episode 209; the full chat will be out very soon - whether that be before Christmas or early in the New Year. It's a bit of a weird time of year for factoring in normal episodes alongside all the many various seasonal episodes that we have in store! Part two will be out very soon! 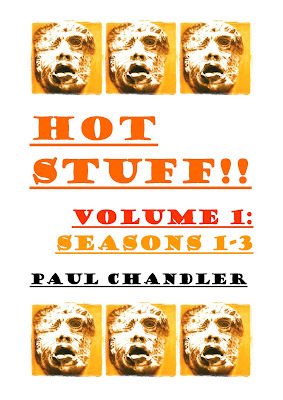 Here we present a special volume which includes the complete first three seasons of HOT STUFF!! you will meet psychos, bounty-hunters, phoenixes, repentant ex-vampires, ghosts of the past, a dj who controls minds and also a whole gang of super cool librarians. Will you join us? Come on – you know you want to!! One of my first books of 2019 will be the 3rd season of KENSINGTON GORE; although it is currently intended that GORE will only be a 4 season series - at least for now; so I'll probably wait until season 4 is released (it's almost written in draft form!) before I release a compiled edition. Next time we may have our Christmas hat on - I'm not sure how many more posts I'll do before the end of the year; so we'll see! Here we are in early December and there are plenty of episodes in store and we're constantly recording new shows! Our schedule does tend to change every time I post, but this is a good guide! 210. Shy Yeti's Big Dinner Date! Paul catches up with his friend OtherPaul for an early birthday meal at a favourite restaurant - whilst the regulars experience both a misunderstanding and an acute case of F.O.M.O.! 211. Tuning In With Freakquincy! This time Mr Yeti talks with Freakquincy from The Gay Wasteland podcast. 212. Video Killed The Podcasting Star! Nick and Paul discuss the big hits of 1979 on both sides of the pond! 219. The Dragon And The Cacti! 220. The Truth About The Murder Mystery Weekend!